2016 was the best year in the whole history of the modern industrial and logistics market in Poland with lease agreements for nearly 3.49 million square meters signed. Last year was a record time/year not only in terms of the level of demand but also in the amount of new space. A-Class warehouse space supply in the whole 2016 year reached a record level of 1.12 million sq m., despite only 140,000 sq m completed in Q4. 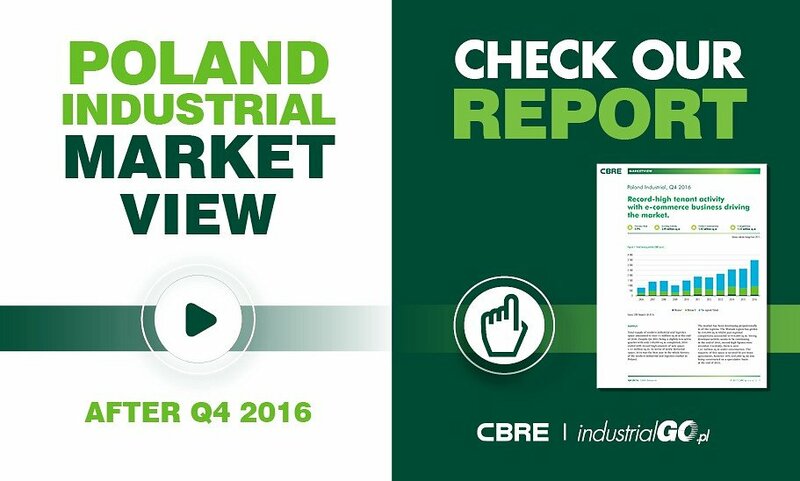 The latest report Poland Industrial Market View Q4 2016 -, prepared by CBRE shows that the warehouse space in Poland exceeded 11 million sq m.. The market has been developing proportionally in all regions. The Warsaw Region has grown by 210,000 sq m., whilst pan-regional completions amounted to 910,000 sq m.
Despite the high development activity, the availability of the vacant warehouse space is still limited. In comparison with the end of 2015 year (5%), the vacancy rate increased by 0.9 percentage points and at the end of 2016 was at the level of 5.9%. On an annual basis, this is a slight increase mainly caused by the formation of a growing number of speculative projects. The headline rents remain stable, showing no significant changes in relation to the previous quarters. Currently, the most attractive industrial and logistics space rents vary between 2.40 and 3.90 EUR / sq m / month. Warsaw City is the most expensive location, with the rates of 4.00-5.50 EUR / sq m / month.